Well today was our first day on the new alternate collection round and we nearly missed it. The alarm went off as normal to get ready for work when we heard the refuse trucks coming down the avenue and realised we had not put out the paper bin or the plastics/glass box. I have to say it is a little noisier when the box is being emptied in relation to a normal bin collection but I can put up with that knowing we are increasing recycling in Wakefield. 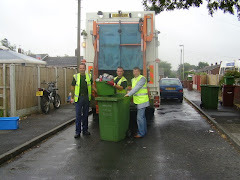 I do hope everyone else on phase 4 had less of an issue with having their bins and boxes out for collection on time and that all households in Wakefield can now say they are now doing their bit for the environment.